Unity Technologies’ keynote from Unite Europe 2017. See the new cinematics tools due in Unity 2017.1 from 00:20:30-00:25:00, then 00:31:30-00:44:00, then 00:47:00-00:50:30 and 00:56:30 to 01:04:30. 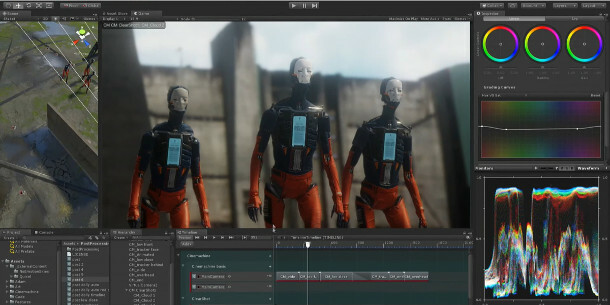 Unity Technologies has given users a new sneak peek at the cinematics tools due in Unity 2017.1 next month: visual editing toolset Timeline, procedural camera system Cinemachine, and the new video renderer. The preview came during yesterday’s keynote at the Unite Europe 2017 conference. Unity has shown off the new tools before – first at Unite Los Angeles last year, then again at GDC 2017 – but yesterday’s presentation was the most detailed so far. It wasn’t a conventional demo, so the coverage is mixed in with that for other Unity tools, but there’s around 30 minutes of footage of Timeline and Cinemachine, which you can find at the timecodes listed above. Timeline is a track-based editing toolset, along the lines of Unreal Engine’s Sequencer. It acts like a combination of the timelines in a 3D animation package and a nonlinear editor, enabling users to edit together animation clips, camera moves and audio tracks. A fourth track type, Activation Tracks, can be used to enable or disable objects in a scene: for example, to start an NPC character moving, or to trigger a physics event. Animations and camera moves can be blended directly in the timeline view; and it’s possible to set up timelines for individual cameras or characters, then combine them in an overall master Control Track. The system works for gameplay sequences as well as cutscenes and cinematics: the first set of timecodes for the video above show the creation of in-game animation. Cinemachine is a new procedural camera system, originally developed as a third-party add-on, and currently available as a free download in the Unity Asset Store. Its creator, veteran DoP Adam Myhill, who previously worked at EA Canada, describes it as “like inverse kinematics for cameras”, enabling users to set up virtual cameras that track moving objects in a scene. Although you can also keyframe movements, setting up camera moves is as simple as selecting an object – or an individual bone, in the case of a character rig – for a virtual camera to follow. Cinemachine then automatically tracks the object and frames the shot, applying dampening, offset and noise to the camera movement for added realism. Version 2.0 of the toolset – the one due to be integrated into Unity 2017.1, also released yesterday as a separate download – also adds a couple of neat new features. One is Dolly Track (shown above, and at 00:37:30 in the video), which enables users to set up a virtual 3D track for a camera to move along, adjusting the shape with standard spline controls. Again, the motion of the camera along the track can be procedural or keyframed, and the result can be previewed it either Edit or Play mode, cutting down iteration time. There’s also a very cool new feature called ClearShot, which causes Cinemachine to detect when the object a camera is following has been occluded by foreground scenery, and cut automatically to an another camera. You can see ClearShot in action at 00:58:45: according to the online documentation, you can even set it to randomise cameras to add variety when replaying a shot. Other new features not shown in the demo include the option to track and frame multiple objects, auto-zoom to keep the object being tracked the same size on screen, and support for othographic cameras. The 2.0 update also introduces a new open API, enabling users to customise any part of the toolset. As well as Timeline and Cinemachine, Unity 2017.1 will also introduce a new video renderer. It can record gameplay footage at up to 16K resolution – “no one’s going to [do that], but it’s fun to think about,” joked Myhill – and even as a series of OpenEXR frames, for use in an offline compositor. 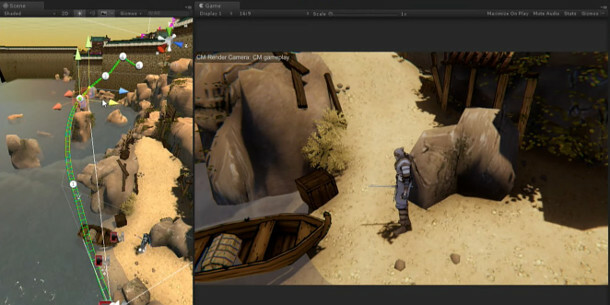 However, Unity Technologies intends for users to be able to do most of the work of creating a cinematic directly inside Unity, if they choose: lights and post effects can also be animated directly in Timeline. That includes effects provided by the free Post Processing Stack add-on, which you can see at 01:00:30, and which provides quite a powerful set of grading tools, including a vectorscope and waveform monitor. Unity 2017.1 is currently available as a release candidate for Windows 7+ and Mac OS X 10.8+. The final version is due to ship in July 2017. It’s available on a rental-only basis: you can find pricing here. 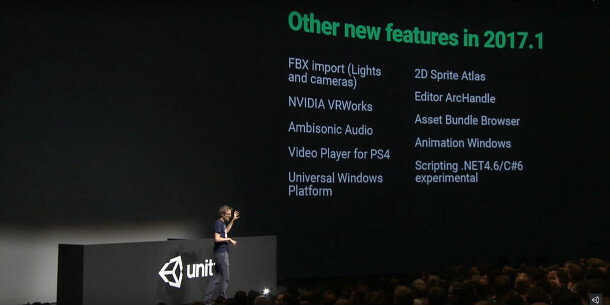 As well as the tools mentioned above, the update will add the features you can see listed in the image above, including a new 2D sprite atlas, and support for lights and cameras when importing FBX files.